We took full advantage of the beautiful weather last weekend and grilled out every night. This chicken was our favorite out of everything we grilled. It was absolutely delicious! This was inspired by my favorite chicken dish at Firebirds Restaurant. I love Firebirds' Smokehouse Chicken Sandwich and decided to make my own version at home. The verdict? Wonderful! 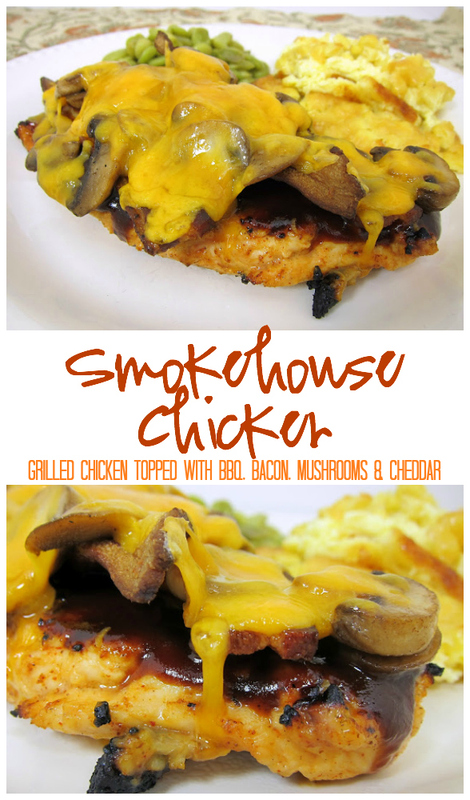 We marinated the chicken in Lawry's Seasoned Salt marinade and topped it with BBQ sauce, bacon, sautéed mushrooms and smoked cheddar cheese. How can you go wrong with that combination? Marinate the chicken in the Lawry's Sweet Southern BBQ with Lawry's Seasoned Salt marinade for at least 30 minutes. The longer the better. Preheat the broiler on your oven. Place cooked chicken on a rimmed baking sheet. Spread 1-2 Tbsp BBQ sauce on cooked chicken. Top with bacon, mushrooms and cheese. Broil until cheese is melted. Girl...you are making me want to break out my grill!! Will you come help me make dinner?? I'll send Chicken Legs right over! WOWzer! That is one fine looking grilled chicken dinner. ooooohmygosh! THAT looks good! It's only 8:45 in the morning, but I could sure go for one of those. I Will be making this...thank you! This is one of my all time grilled chicken favorites. I've used that Lawry's marinade, last year and really liked it. The bottle just disappears so quick, they need a bigger size! Have you seen their new "seasoned seasoned salt" line with Southwest Season Salt, and stuff like that? Love love love this dish & so does my family. Its so flavorful & delicious! Definitely a new favorite in our home! Tiy - Yay! So glad everyone enjoyed it!